Indications for this procedure are generally for cases where additional mechanical strength is needed such as untreated Achilles tendon rupture with weakness or painful heel spurs (Haglund’s deformity) that require Achilles tendon detachment to remove and FHL transfer is used to add mechanical strength to the repair. FHL transfer is also helpful in improving biological healing of surgical treatment for painful chronic tendinitis of the Achilles tendon. The two-incision technique involves making an incision on the inside arch of the foot where the FHL tendon is harvested. A second incision is made in line with the Achilles tendon on the inside aspect of the lower leg, where the Achilles tendon is identified, as well as the muscle belly of the FHL. The tendon is then cut closest to the toes and looped through the calcaneus and back onto the Achilles. Alternatively, the FHL can be anchored to the bone directly with suture anchor devices. The one-incision technique involves making an incision in line with the Achilles tendon on the inside aspect of the lower leg, where the Achilles tendon is identified, as well as the calcaneus and muscle belly of the FHL. The FHL tendon is followed as far as possible into the foot, which is then cut and fixed to the calcaneus. 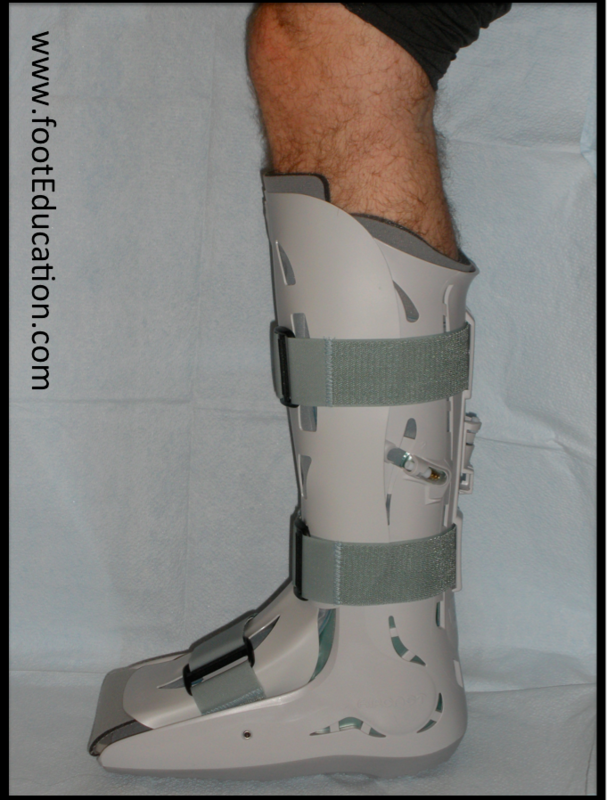 Patients should generally protect the repair for about 6 weeks to let the tendon transfer heal, while being non-weight bearing or limited weight bearing through the heel in a cast or cast boot. In some cases a wedge or several wedges are placed into the boot or shoe to protect the FHL and/or Achilles from overstretching. Once the repair has adequately healed, the patient can begin moving the foot with minimal resistance and eventually increasing resistance. The patient can begin walking as tolerated in a protective boot, such as a cam walker, and begin physical therapy to work on strength and endurance over the next few months. Usually, around the 10-12 week mark, the patient can start to transition. About 50-60% of recovery is gained within the first 6 months; however it may not be 15 -18 months for maximal improvement. Failure of Graft: Although uncommon the graft may become incompetent or pull out. Usually, if the graft pulls out it will happen in the first few weeks after surgery – but can occur 9 months or more afterwards. Wound Healing Problem: Although this is usually a general complication for most procedures, the wound healing complication is particularly concerning for an FHL to Achilles tendon transfer because the Achilles tendon region has relatively little skin coverage, making the wound healing problem more susceptible to quickly extend down to the tendon. Infection: Similar to a wound healing problem for an FHL to Achilles tendon transfer, an infection is also increased significantly. The source of an infection is usually from the wound healing problem and can be very serious, possibly requiring further surgery. Weakness of 1st Metatarsal: Because the FHL is responsible for flexing the big toe, there may be weakness post-surgery. Fortunately, this is not clinically significant.